Temporal landmarks, especially in the multilateral fora, are marked tools for strengthening institutional memory and more importantly for highlighting procedural failures as well as accomplishments. The substantive rationality of such dividers ought to translate to better outcomes for the intended audience. 1995 was one such year which saw the fourth world conference on women in Beijing. Delegates from 189 member-states of the United Nations delineated 12 “critical areas of concern” to guide the mainstreaming of gender in policies, strategies and programmes, and prepared a declaration and platform for action, which came to be known as the Beijing Declaration. The 57th session of the commission on the status of women held in New York in March 2015 decided to conduct an appraisal of the implementation of the Beijing Platform for Action 20 years after its signing – known as Beijing plus 20 in the multilateral-ese. This year thus provides a frame for stock-taking where statistical narratives would reflect tangible outcomes for women in terms of progress over the last 20 years. One such report released last week was the Inter-Parliamentary Union (IPU) report on women in parliaments across the world. Succinct and revealing, it tells a story of how far half the world’s occupants have progressed, or rather not progressed, since the historical signing of a document in Beijing. “What stands out is that there has been regular and important progress. All regions have progressed and majority have doubled [their participation of women with] the only exception being the Asian region,” said Kareen Jabre, director of IPU’s programmes division. “However, there is a slight nuance in the data of 2014 that in 2014 there was an increase of only 0.3 percentage points whereas in 2013 the increase was 1.5 percentage points which indicates there is a slowing down in terms of progress,” added Jabre. Globally, the Americas – both North and South – witnessed the greatest aggregate changes in the past 20 years with the average percentage points rising by 13.7 percent. Argentina was the first to implement gender-based legislative quotas in the region. Majority in South America have some sort of legislative quota for women. “Though the North America does not have quotas but there has been some progress due to proactive measures at the institutional level to support women run for elections, especially by NGOs. There have been conscious measures to facilitate women’s access to the parliament. The America case shows that if you don’t support women then it won’t happen on its own. If you don’t have quotas then you will have to find other measures to actually facilitate women’s access to the parliament.” Jabre concludes. Both Europe and Africa have increased around the same percentage points in the last 20 years. Fabre argues that the more traditional [European] democracies have looked at themselves and realised that they are not as open to women as they seem to think and have adopted quotas like France, Belgium, Portugal and Spain to achieve parity in their parliaments. Except for the Balkan area, the countries in the former Soviet bloc have shown less progress, probably due to their distaste for quotas owing to past experiences of reservations. The most striking data in the findings, however, is that the European monopoly over the statistical representation of gender in parliament has been broken. Whereas in 1995 eight of the top 10 countries were European, in 2015, four of the top 10 are African countries. Rwanda has shown stupendous growth of the last two decades with a whooping increase of 50 percent points with 63 percent of women representation in parliament toppling Sweden as having the maximum representation of women in parliament in the world in 2015. “Rwanda has used its post-conflict phase to reconstruct and implement change for progressive women’s political participation and the same can be said of Kenya,” says Jabre. India has effectively managed to buck the positive global trend of doubling women’s participation in parliaments from 11.3 percent in 1995 to 22.1 percent in 2015. India has progressed only by 4.8 percentage points in the last two decades whereas the global average is 22 percent. 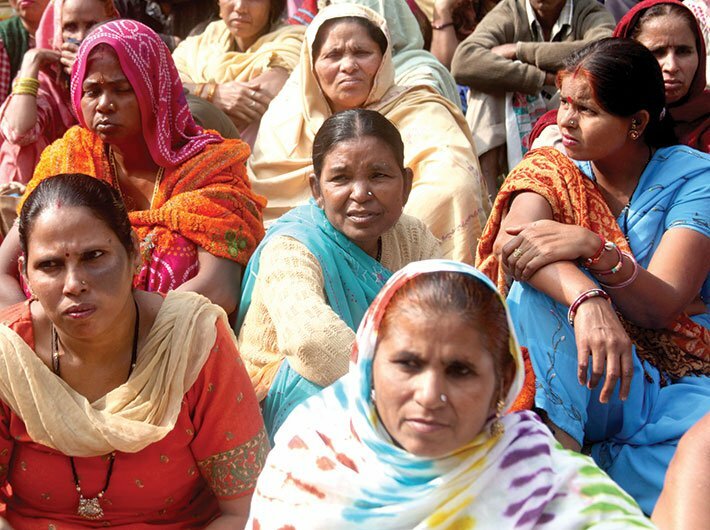 Contrary to popular notions of increased women’s political participation in India in the recent decades, India lags behind Nepal which is categorised as a least developed country (LDC) and the war-torn Afghanistan, according to IPU estimates. Asia, as a whole, has also stagnated and comes fourth among the six global regions. Couched between the Syrian Arab Republic and Jordan, India figures 103rd in a survey provided by national parliaments of 190 countries on the percentage of women in the lower house of the parliament. Out of 543 seats, after the 2014 elections, 65 are held by women, constituting 12 percent of the total. The upper house of parliament shows a similar trend with 31 of the total 243 seats held by women, constituting 12.8 percent. Some of the states that fare better than India are Saudi Arabia, UAE, Indonesia, Morocco, Burkina Faso, Niger, Syria, Malawi, Libya, and Mongolia. To put the statistics in perspective, Saudi Arabia is the only country in the world that bans women from driving and has granted voting rights to women only in 2011 but saw a rise in women’s participation by 19.9 percent in 2013 – prior to which the Arab parliament was an all-male body. In the past 20 years, the Arab states have seen an average gain of 11.8 percentage points whereas Asia as a whole has gained only 5.3 percentage points. “What is really striking about the Indian case is that it has this big pool of women at the local level who have gained experience because of the quota system. There have been surveys in these places that show people’s perceptions of women’s leadership have changed in communities where there is participation. At the local level there is an amazing potential of women that is not making its way up to the national level,” says Jabre. Among the Asian countries, except Timor Leste at 38.5 percent, no state had 30 percent representation in the lower or the upper house of parliament. Some countries came close, like Nepal with 29.5 percent and Afghanistan with 27.7 percent. “In Asia there is a resistance to quotas and political parties actually opening the doors to women. It is really, really a slow increase. There is a trend of more women running for elections, like in Indonesia, but that does not imply that they are getting elected. Generally what has allowed for change are quotas but they are not the only solution. We are reaching a point where we have to think creatively of other ways to increase political participation. But it is the key element that has triggered the change over the past 20 years,” states the IPU. The obstacles to achieving a semblance of equity as envisaged in the Beijing Declaration are many. The IPU cites that some of the reasons are domestic responsibilities, prevailing cultural attitudes regarding roles of women and lack of support from family, among others. It is not difficult to see the vicious circle that keeps the equity objective a far cry from reality. In another report also released last week by the ILO called the ‘Motherhood Pay Gap’ reveals that the gender pay gap at the prevailing rate will not close in the next 70 years. Apart from a pay gap, women are doubly affected also by a “motherhood pay gap” — women with children can expect to earn less on their return to work and this gap increases with an increase in the number of children. However, the trend is reversed for men as fathers earn more than childless men. The increase in the levels of participation of women in labour markets has been abysmal in the last two decades – since the Beijing Declaration the difference in men’s and women’s labour market participation rates has dropped by only 1 percent. “One of the major influences on women’s economic activity, particularly after marriage and motherhood, is whether the welfare state treats women as primarily economically independent or dependent adults. The extent to which women are incentivised or disincentivised to engage in wage work will clearly have an impact on motherhood gaps,” states the ILO finding. In India where women are seen as primary care givers, human resource experts say that there has been no tangible increase in paternity leave. Only a handful employers in India provide paternity leave mainly because Indian laws don’t require it. There is paternity leave in the formal sector, where there is a two-week paternity leave only for central government employees, while the Maternity Benefit Act of 1961 provides up to 12 weeks paid leave for working women. This leaves the private sector as well as the informal sectors to do as they please which is not much. The situation is in stark contrast to several countries where separate leave is given to both the mother and father after the childbirth. Compare the situation with Sweden where there are 480 days of paid leave per child to both parents of which at least 60 days have to be used by each parent. According to the Swedish government’s website, this is “to encourage equality and shared responsibility”. Sweden, it is important to note, has consistently been one of the top 10 countries for political participation in the last two decades and more. Norway also does a progressive calculation where 10 out of 46 weeks of fully paid leave is reserved for fathers and nine for mothers and the remaining 27 weeks are divided according to the parents’ wish. In the last two decades, there has been an increase of 28 percent of states giving paternity leave to encourage men to shoulder domestic responsibilities leaving women freer for other non-domestic works. On the other hand, today 51 percent countries offer some form of maternity leave – up from 38 percent in 1995. However, 41 percent of all women don’t have “adequate protection”.